When you’re already a member of one of rock ’n’ roll’s most legendary, successful bands, odds are you don’t get the urge to make a solo album unless you have something to say. The past few years have been rather bumpy ones for Ronnie Wood, who hit some turbulence in his personal life only to see it parodied by the tabloid press. It wouldn’t be all that far-fetched, then, to think he may want to get some things off his chest through his music. 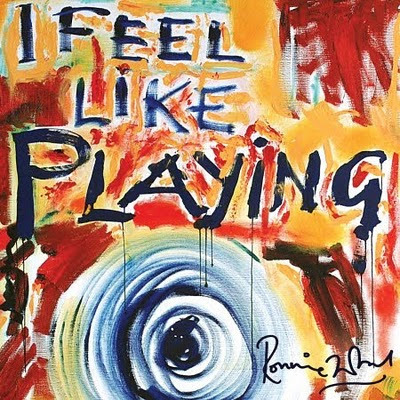 Not that the Rolling Stones guitarist should need a reason to record a solo album; his seventh and latest such release, I Feel Like Playing (Eagle Records), is fantastic. A venerable slate of guest and backing musicians make appearances throughout, including Slash, ZZ Top's Billy Gibbons, and Bobby Womack. Also on hand are vocalist Bernard Fowler and bassist Darryl Jones—both men stalwarts of the Stones touring entourage—giving Wood some of the comforts of home even while he’s out on his own. For his part Wood sounds invigorated, with his raspy, Dylanesque singing on rambunctious cuts like “Thing About You” and “I Don't Think So” betraying a kind of precocious, little-boy-inside-a-man enthusiasm. Things get even funkier on “Fancy Pants,” a modish ode to British men’s sartorial excess set to a raunchy, thick-riffed groove. It’s not all roguish mischief and bravado, however, as “I Gotta See” features Wood and Fowler engaging in a soulful, near call-and-response duet that gives the song a gospel resonance. Wood turns strikingly tender and compelling, though, on “Why You Wanna Go and Do A Thing Like That For,” his grim vocal betraying the fragility of a heartbroken man. In the end, though, whether or not I Feel Like Playing is Ronnie Wood's way of working through some things doesn't matter as much as how good of an album he has made.